By December 1985, most of the work on Jim’s second fantasy film Labyrinth was complete. The major filming started that April and wrapped September 6th. In October and November, co-producer George Lucas gave his comments and worked with Jim on some of the editing. Jim flew back and forth between Lucas’s office in San Francisco, the Fraggle set and taping of The Muppets: A Celebration of 30 Years in Toronto, and the post-production for Labyrinth in London. The December Hoggle re-shoot was just a small fix related to some portion of the editing process. Hoggle, Sarah’s hostile guide through the Labyrinth, is one of the most important characters in the film both thematically and technically. The animatronics used to perform him were ground-breaking and opened up tremendous possibilities for expressive performances. 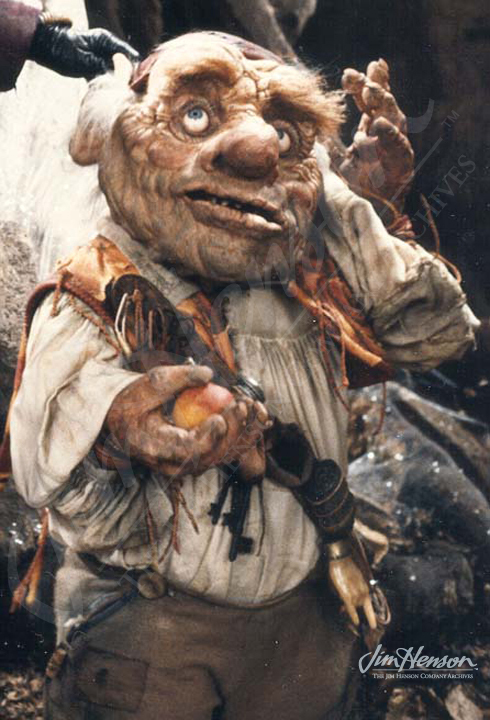 Jim explained that, “Hoggle is certainly the most complicated puppet creature we’ve ever built. It’s the most technically elaborate face because we’ve put about eighteen motors in there, to control all the different portions of the face, and four people operating that from outside by radio control. It creates enormous problems in just trying to figure out how to make that into an expression.” Brian Henson was one of those performers and also provided the voice. Actor Shari Weiser was inside the costume performing the body movements. Having five puppeteers perform one puppet was an extremely difficult collaborative process. As Brian Henson described it, “Shari’s inside the costume. She does all the body movement and her head is inside the head. However, the jaw is not connected to her jaw. Nothing that the face is doing has any connection with what she’s doing with her face.” And to make things more difficult, there was no video monitor inside the puppet; Shari’s only view was intermittent, through the flapping mouth. Watch a clip from Inside the Labyrinth 1996 behind the scenes documentary. 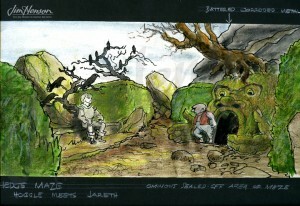 Set design by Elliot Scott showing Hoggle meeting Jareth in the hedge maze. This entry was posted in 12-December '85, 1985, Labyrinth and tagged Brian, Hoggle, Jareth, Lucas, Scott, Weiser. Bookmark the permalink.